Property owners in the Limnes (lakes) area of Pissouri are still in limbo despite the previous Cyprus Interior Minister promise to pay for the mess, which at that time was estimated at up to €20 million. HOMEOWNERS in the Limes area of Pissouri are at a loss over what to do next after 60 homes in the area suffered severe structural damage and three were deemed inhabitable. Members of the House Internal Affairs Committee on Monday learned that many of the houses had been built on former lakes that had been shored-up with construction site rubble. MPs also learned that the houses had likely been built without a geological study being carried out in advance and that the cost of structural repairs was now expected to cost €4 million more than the original €15m estimate to cover the cost of rebuilding the most extensively damaged homes. The MPs criticised the government for allowing the area to, in 1980, be declared a residential zone with chairman Eleni Mavrou noting that, under the legislation still in place, someone applying to build in the affected area today would still be given the go ahead. A Paphos District Administration representative told MPs that three or four lakes in the area – incidentally known as ‘Limes’ (Lakes) – were dried out from 1963 onwards while Limassol District Administration engineer Marios Alexandrou said cement had to injected into the land to make it more stable. He also noted the houses that had become problematic to a lesser or greater degree had been built between 1986 and 2007 and began showing signs of the problems in 2011 and 2012. The problem was made worse, Alexandrou noted, because there was no way for excess water to drain away. Speaking on behalf of an initiative group representing residents of the affected area, Elina Zoi, called on the state to rehome all those affected after putting their trust in the Republic of Cyprus and investing their money in a home. Homes in Limnes are not generally built on fill. My home and others were built on virgin land and the adjustment of levels was to cut not fill. The problem n Limnes is geological not design or construction. The destructive movement is lateral not vertical. If the District Administration permitted the construction of some homes on fill, then it had a duty of care to homeowners to ensure both the quality of fill material and the design and construction of substructures were appropriate for the construction of homes. The suggestion, or apparent suggestion, that individual homeowners can carry out works to their homes to resist the forces of landslide is ludicrous and calls into question the professional competence of the individuals offering such advice. Stabilisation, assuming that it is technically feasible, will costs tens of millions. The logical and cost effective remedy is for the state to act as insurer of last resort (as in other European countries) and to buy those homes located on or near the fissures and to demolish them. The land reverting to agricultural use or to remain fallow. No one to my knowledge has sought to blame individuals or the State for a landslide. Homeowners do however expect the State to behave as other advanced countries in the EU and to protect the human rights of citizens and residents of Cyprus affected a natural disaster. Homeowners in Limnes have repeatedly invited the Minister and others to visit homes in Limnes to view for themselves, The Minister has not done so and has therefore had to rely on untrue statements that misrepresent the physical conditions in Limnes. I have just received a report from someone who was present at the House Committee meeting. The Limassol District Administration did not say that lakes were filled in from 1963. This was “journalistic licence”. Members of the parliamentary Interior Committee, the Community Council of Pissouri and affected residents Lakes region, which suffers from landslides and soil movement, argue that the state has responsibility for the dangerous situation in which they found many houses and should take the movement of residents safe area, but the representative of the Interior Ministry in yesterday’s session of the Committee was not able to say anything for financial support or compensation of those affected. 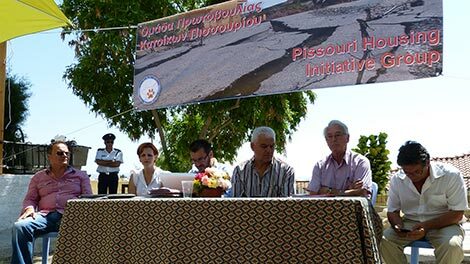 It is clear from what was said yesterday by the official point of view, that the state does not consider itself responsible for the ground movement Pissouri therefore does not intend to support financially the major repairs that need homes to make them safe and habitable, nor the cost for eventual removal and installation on a different region. As the representative of the Ministry of Interior said, everyone should take a piece of the responsibility it deserves. That is, the state can take to repair infrastructure and stabilization of the region and the residents repair their houses. Also said that the state already spent half a million to repair roads, rehabilitation of pavements, construction of new pipelines and rainwater collection surface water. The cost, he added, for soil stabilization is expected to be huge, but not calculated at present. He said it was estimated that the repair of the houses amounts needed 75 grand euro to 200 000 euro. About 60 houses are more or less affected, while three houses but is completely inappropriate and issued decrees their abandonment. He explained at the hearing that the buildings that were destroyed or shattered by soil movement and landslides was licensed by state authorities before passed the Law on Urban Planning, and the area was legally housing. The AKEL MP Adamos Adamou, who entered with Giorgos Georgiou issue, wondered whether those responsibilities are not given licenses without warn residents about the subsoil risk. The MP EDEK Costis Efstathiou noted the existence of State liability because it did not prevent the construction in the area and therefore “must compensate epireasthentes”. From his side the Interior Ministry insisted that bear responsibility and civil engineers recruited by the owners, as they had, he said, to investigate the subsoil and to locate the static problems and dangers lurking. He even said that “we built on the rubble” and the importance of “the growth inhibition in this region.” The commune Pissouri described the issue as a humanitarian and requested ownership by the state. The Limassol DISY MP Andreas Kyprianou said the search today the guilty will be an endless effort. He is said, to focus on the problem management today. Calculated that no repair of houses will require EUR 4 million and estimated that it is more logical and attractive option to relocate the residents, with the financial assistance of the state, the people themselves, and insurance companies. Representative of residents but said that although the houses had insurance coverage, insurance invoked “fine print in the contracts,” according to which excluded from coverage “geological phenomena.” It also was said by residents, none influenced not resorted to court against the insurance or other stakeholder. The Limassol AKEL MP George Georgiou insisted that the state must come helper, as he said, in the case of Kivides and Alassa. This view was echoed by George Perdikis. Interesting! “many of the houses had been built on former lakes that had been shored up with construction site rubble”. If that were the case, one wonders why the Government Offices approved the plans and also issued the necessary Building Permits, without demanding that the design of the foundations be such that they would cope with the ground conditions and also insist on the above mentioned geological study to be carried out before work started? The Paphos District Administration representative who was aware of the lakes that had dried out (he is not named of course) should also have been aware the the lakes were a product of the current level of the Pissouri Aquifer which was 30 Mtrs below ground level 25 years ago is now only 6 Mtrs. The ground movement started in 2012 and has deteriorated progressively, since there was heavy rainfall that year. Mr Alexandrou knows full well that the idea of injecting Concrete (cement) is not the answer. His office has already spent a lot of money installing road drains (3 years late following recommendations from the Paphos Geological Office) which proved not to solve the problem. Bearing in mind that rain does not only fall on the roads but also on gardens and fields etc and draining water from your garden to the road as he and the Paphos office advised is difficult when your garden is below the level of the road. It is made even more difficult when the LDO concretes in two drains which were actually draining gardens to the road. A recent study by a highly qualified Geological Engineer, who has been employed in the past by the Cyprus Government has stated that the ground is moving i.e. a landslide, possibly triggered by heavy rains and uncontrolled ground water from the village above the slope. All of the above is known to the Government Offices concerned and yet they still keep pushing out the old story. It’s the developers. All that is needed is two brain cells to work out that since there were so many different developers, architects and engineers involved and all of the different properties decided that they would all fail at the same time. It is not the developers, it is the faceless people who condoned the area being designated from Agricultural to Residential and then gave out Building Permits like raffle tickets. I do not know why the District Administration makes the comments that it does, knowing that they are factually incorrect. Misleading a Committee of the House of Representatives must surely be a serious matter with serious consequences. A Geotechnical Engineer of international repute visited Limnes in April 2017 and reported that there is no topographical evidence of lakes or former lakes in Limnes. Apart from any other consideration most of the area slopes five to ten degrees. Dr Kyriakides, the District Engineer of Paphos, has identified the area affected by land-slippage in Limnes to be 500,000 square metres. I suggest that a lake, or series of lakes, encompassing half a square kilometre would have been noticeable. Other than material deposited 20,000 years ago, there is no fill under my house, or many others which were also cut into the hillside. If homes were built without geological studies being carried out, then how was building consent obtained? Is it being suggested by Limassol District Administration that they themselves gave building consent corruptly? Four Cypriot Civil Engineers (including the Past President of ETEK) and an internationally renowned Geological Engineer have all attributed the structural damage to homes in Limnes to landslide, caused probably by unmanaged ground water. Another Engineer (selected and appointed by ETEK) reported that he saw no evidence of poor construction or poor quality materials. In 2015 a Chartered Valuation Surveyor attributed the diminution in value of one house in Limnes from E265,000 to E7,000 due to “the geological problems in Pissouri”. One does not need to be an expert. One has only to walk around Limnes and note that the clearly visible geological fissures form the shape of a horseshoe. This is classic evidence of landslide. Why Limassol District Administration seek to deny a natural geological phenomena is a mystery to me, and I suspect to them.